My dear friend Moira, author of the Good Egg blog makes a fantastic zucchini loaf and I asked her to share her recipe. I decided to do my own spin on it as I was hoping to get my daughter to eat it, the answer….. chocolate. For the original recipe, omit the cocoa powder and substitute raisins for the chocolate chips. This recipe can me made as a loaf or a muffin. A tip on muffins. Most recipes yield 12 plus muffins which is more than most families can eat in a day or two while fresh. Here is the tip. 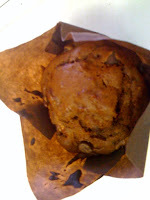 Scoop the muffin batter into the paper muffin molds and freeze in the the tin. Once frozen you can take them out and store in a Ziploc bag. Now you can bake from frozen anytime you crave a fresh muffin. Just add about 15-20 minutes to the baking time. 1. Grease two loaf pans. Preheat oven to 350. 2. Beat eggs. Add sugar and beat until thick. Beat in oil. 3. Mix flour with other dry ingredients. Add chocolate chips and nuts. 4. Stir into egg mixture just until well blended. Pour into the prepared pans. Bake for 1 hour or until toothpick comes out clean. Let cool in pans. Muffins will bake in abouot 30 minutes. Love it! Chocolate makes the world go round!